Andean Magic Art Jewelry’s mission is to hire young people from Peru’s poorest rural areas and train them to become skilled artisans making quality Andean ancestral alchemy jewelry. In this way, it helps open the door to a better quality of life for these people and their families. 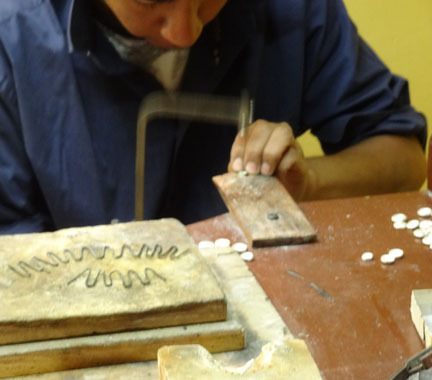 This is accomplished through an eight-year apprenticeship program, which thoroughly trains each artisan to meet the high level of quality workmanship expected from Andean Magic Art Jewelry. Apprentices have the flexibility to work from home, as this enables them to care for their families and maintain other responsibilities on the home front. About 60 artisans currently create our jewelry from within their homes. For their first two years in the program, we give our artisans all the materials they need and training to hone their craft at home. After the first two years, the artisans buy their materials from us, as they continue to improve their skills. During this time, we sell their work through our stores and they are free to have other companies market their work as well. During the off season, we also have eight artisans working on site at the Cusco workshop and 16 in the peak tourist season, from May to November. Since the company’s inception in 1974, more than 100 young Peruvians (including four generations of families) have completed our apprenticeship program and launched sustainable careers as skilled artisans making Andean jewelry.